Let’s face it, kids are hard on their clothes, especially their shoes. This gets magnified when water and mud are in the equation. All kids love jumping in puddles, running to splash in the waves, following dogs through streams and off roading into the bush. You can’t leave their feet unprotected as the hot sand and sharp rocks can quickly turn a good day bad. That is where the best kids water shoes come into play. There are many options on the market, that is why we have found and compiled a list of the best toddler water shoes. These shoes are made tough so they can withstand all the dirt, sand and mud your kid throws at them. Choosing the best water shoes for your toddler doesn’t have to be an overwhelming task any longer. Stride Rite is a company that has been around since 1919. They have used this time to hone their craft. They are all about making shoes that kids are comfortable wearing all day. Unlike traditional water shoes, the Made 2 Play Phibian Water Shoes have been designed to be worn all summer – not just at the beach. The design of these shoes is second to none. They feature a lacing system and even a velcro strap to make sure they stay on their feet. Small touches like fabric around the ankle ensure that they are comfortable while still being exceptionally functional. The Phibian Water Shoes come in sizes for toddlers (1-4 years old), little kid (4-8 years old, and big kid (8-12 years old). In each of these categories there are around 5 sizes which make it super easy to choose the right fit. 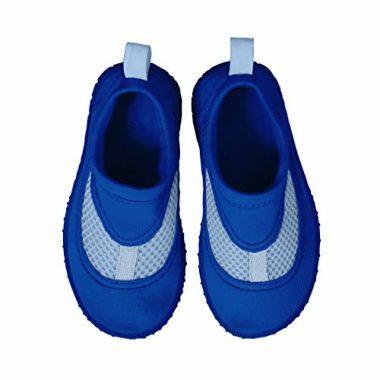 These are the best water shoes for toddlers and kids that are machine washable which make them a breeze to clean. If they get too muddy or sandy simply hose them off and they are ready to go again. The best part is these are also quick dry so your kids won’t have to wait to get back to playing. An antimicrobial lining keeps your kid’s feet not only clean but also not smelly. As an added bonus these shoes are 100% vegan meaning no animals were used in making these shoes. 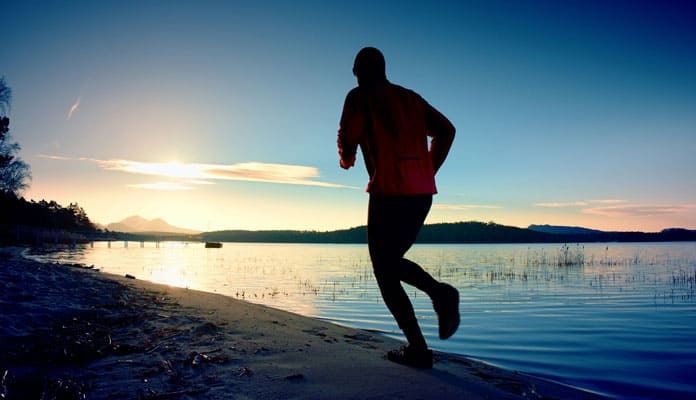 L-RUN is a quality company that has an expertise in making fitness and water shoes. They have specially designed anti slip soles while trying to make the lightest shoes possible. All of this experience has been used to create these Kids Swim Barefoot Water Shoes. These are the best water shoes for toddlers and kids. They come in sizes ranging from 1-2 to 12.5 – 13 and everything in between. These are shoes that are guaranteed to fit your child. There are also 36 color patterns to choose from so no matter what your child’s favorite is L-RUN will have it. These water shoes have also been made to be super easy to pack for your trip. They are able to be rolled into a ball and bounce back when you need them. They are made from polyester material that will not retain water which can make walking difficult for young children. Polyester is also a material that is quick to dry so you won’t have to wait hours for these water shoes to dry. The shoe’s material is also durable enough to stand up to even the roughest shores. This is further reinforced by a sticky rubber sole that adds traction to their step. These top rated toddler water shoes are perfect for the beach. Protecting your little ones feet from the hot sand means that beach time won’t result in the dreaded melt down. You will love that these shoes are easily machine washable. Coming in 9 different color options, your child will be able to easily find a pair that suits their style. These affordable fun water shoes come in sizes 5-10 allowing you to get a new pair as your child grows. The thick neoprene material hugs your child’s foot while not constricting. The waterproof neoprene keeps your child’s feet warm in cool waters. The flexible fabric moves with their foot providing a stretchy elastic fit. This fabric is quick dry allowing them to transfer perfectly between the water and the beachside. The rubber sole provides good traction for slippery rocks while not adding additional bulk. Thick enough to offer skid proof protection while still thin enough to flex and feel the ground under you is the major appeal of these shoes. The heel pull tab allows your little one to show off his independence putting these water sock on solo. The no lace design makes it easy for your child to slip on and off on their own. The adjustable tight cord on the back of the shoes secure the shoes to their feet with ease. Giotto is one of those companies that prides themself on great customer service. If you have a problem with these shoes simply inform them and you can return them with no hassle. They will also do their best to resolve any issue you have. These water socks are more of a simple slip on design. The material used is breathable and stretchy meaning they will be able to be put on and fit comfortably. There is no bulky seams or fabric that can cause irritation to their feet. This also makes them lightweight. The soles are made of a rubber material that has added texture to create excellent tread. Giotto has made your style a priority and offer 59 color schemes to choose from. Like other water socks of this style, Giottos version are quick dry. This means you can leave them in the sun for a bit and can rest assured they will be dry. What makes these water socks amazing is that they don’t just have to be used in the water. They make excellent slippers for around the home to keep your kids feet warm and ensure they don’t slip. iPlay makes these quality pool shoes. With a comfortable shell and thick sole, these shoes provide all the traction and support needed for hard surfaces. Available in many different sizes and 6 different colors, this shoe is a great option for all your kids. These water shoes are made of a neoprene-mesh combo. 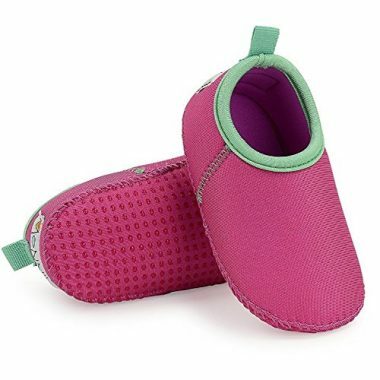 They provide excellent breathability to your little ones feet, even when they are wet. The high quality material has fast drying technology making them an excellent water shoe. The best part is that these are also lightweight. Your toddler won’t even notice that they are wearing them. The soles of these shoes are made of a thick rubber. These provide adequate traction and non-skip protection to your roaming toddler. 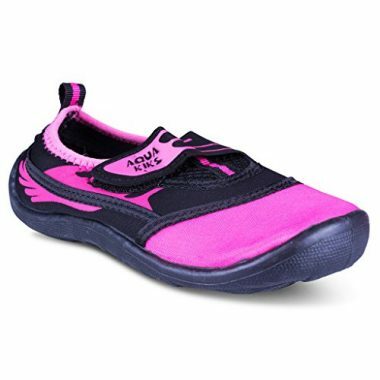 With a built in pull tab these shoes are easy for your child to get on and off with ease. This means they will be putting them on all by themself in no time. They also are incredibly elastic which allows your child’s foot to sit comfortably without any pinch points or added unnecessary friction. They also hug their feet making them great swim shoes. These are not your typical water shoes. They feature a fully ventilated skin that allows your foot to breathe and dry almost instantly. The mesh also allows a snug fit without rubbing or chaffing that a fabric shoe is prone to. 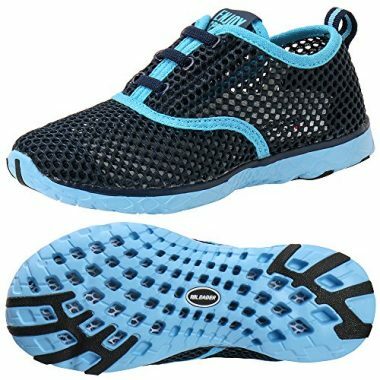 These water shoes also come in 7 great colors from red to blue to black. 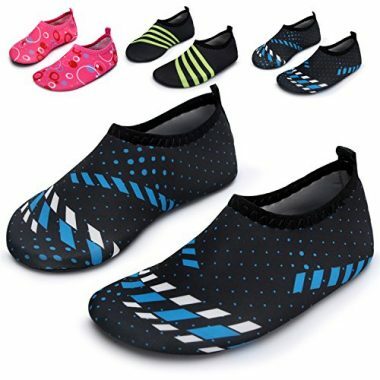 These Kid’s Slip-On Quick Dry Water Shoes also have a sole that lets water drain easily. These holes also add great traction when hiking on slippery rocks. The holes allow water out while not allowing debris to enter the shoe. You won’t have to worry about you child’s feet being irritated at all with these shoes. Even the sole has been made from a material that doesn’t retain water. They stay on your kids feet with a fast adjusting elastic strap. This makes them easy to put on and take off. There is also an easy to use pull tab on the heel. Once you show your toddler how to put these on they will be mimicking you in no time. These are the best water shoes for toddlers and kids that they can wear all day. They are comfortable and won’t cause discomfort even after a long day at the beach. These baby shoes come in three sizes including small, medium and large. The sizes are based on the length of your baby’s feet. For example, the small size is for feet around 4.9 inches and for kids from 6 to 12 months. There are also four colors to choose from: blue and yellow, green, dark blue, and rose red. This means they will fit your kids style and go with any outfit you put them in. What makes these swim shoes stand out is their lightweight design. They weigh only 0.07 lbs. Yes you read that right. These shoes will allow your kids to play without weighing their feet down with heavy shoes. They probably won’t even realize they are wearing them. The shoes are made from a waterproof neoprene material. This makes them lightweight and also able to float on the surface of the water. The neoprene material also keeps your children’s feet warm even in cold water. They act as an insulator to keep the heat inside the shoes, unlike mesh water shoes. This design also doesn’t allow sand to easily enter them which is also great for fussier babies. These Unisex Baby Swim Shoes from Suiek are also excellent for new walkers. They allow your baby to walk normally without having to alter their gait for heavier shoes. Your baby will love being able to walk on the sand or rocks in comfort. Norocos makes these top aqua shoes for toddlers. The socks come in a multitude of sizes as well as 13 different color options. The low profile design hugs your child’s feet so they do not interfere with early walking. These shoes also have a pull tab on the top of the heel. This allows you to show your kids how to put on their own shoes. They will love the indepence this gives them and will be putting their own shoes on in no time. This polyester-spandex shoes sit comfortably against your child’s shoes. The material allows these shoes to dry quickly making them a great water shoe. The elastic design makes them easy for your child to independently take them on and off. These shoes are designed to float in the water. This gives you extra peace of mind if your child takes them off while in the water. These barefoot socks feature a soft rubber sole that your child will love. Not overly thick these shoes are designed to keep your little one light on their toes and comfortable. This high quality rubber protects your child from glass and rough ground. The lightweight design makes it so that your child will forget they’re on their feet. 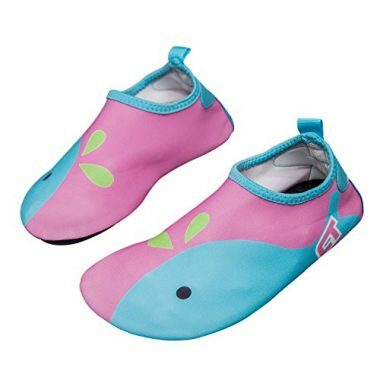 These socks are designed to stay on your child’s feet securely which makes them excellent swimming shoes. These shoes work well for snorkel vacations as they stay securely on your child’s feet. Perfect for playing in the sand, skipping rocks in the river or trying their hand at paddleboarding. 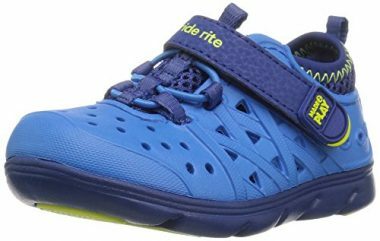 Kids water shoes reviews are raving about these stylish water shoes. Coming in a fun black and pink design your little one will love these shoes fit a whole array of sizes. These water shoes are an excellent choice for those looking for an all around sneaker. Suitable for everything from the beach to a hike, these shoes go where your child goes. The fitted uppers of this shoe are designed to fit snug to your child’s foot which works to keep sand out. The quick dry synthetic material ensure your child does not experience any chafing from wet shoes. Odorless material and breathable technology makes it so that these shoes stay fresh. The rugged rubber sole is designed to perfectly protect your little girls feet. These soles give your child the perfect amount of traction. This allows them to play on rocks and run and splash safely. Perfect for the beach these water shoes were designed for playing in water. An easy pull tab is featured on the back of these shoes. This allows your little one to easily pull the shoes on independently. The front velcro clasp provides a snug fit unique to your little ones growing feet. Minnow makes these excellent water shoes for toddlers. Available in two different color patterns these swim shoes come in at an unbeatable value. 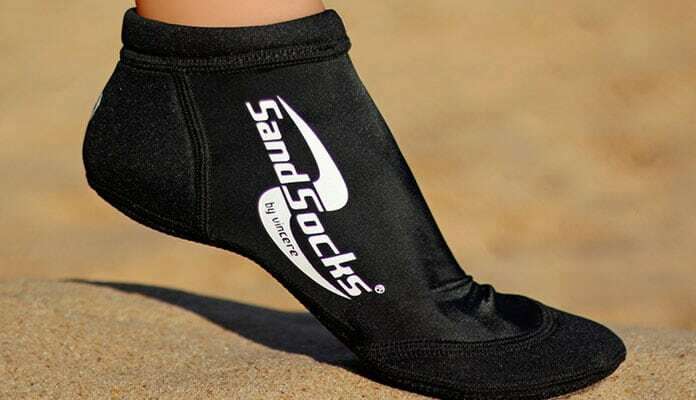 These socks are designed to give your child protection from the hot sand while not adding any bulk to their toes. Made of 100% high quality neoprene, these shoes hug your little ones feet. The quick drying fabric acts as a second skin protecting your child as they explore the beach. Perfect for lazy beach days these shoes will provide some temperature control staying securely on their feet. Designed to hug your child’s feet these shoes will keep the sand out working to prevent chafing. These shoes do not have a rubber sole and are instead soft socks. This allows your child to move freely but do not make good walking or hiking shoes. Acting as a second skin these socks do have anti-skid dots to help give your child traction on slippery rocks. These shoes are ideal for snorkel vacations as they stick securely to your child’s feet. Playing at the beach can be hazardous for children. The hot sand can burn their feet while they can be unstable or slip on wet rocks. Water shoes can protect their feet while giving them the stability they need in uneven terrain. Summertime often calls for different gear than any other time of the year. As you are going to buy specific summer clothes, your child will need shoes that will withstand the harsh sun and wet environment. You may be thinking “Why don’t I just put regular shoes on my toddler?”. But once regular shoes get even a little wet they get heavy and uncomfortable. Water shoes are designed to not retain water or get heavy when they’re wet. Most have drain holes and specially designed material which makes them able to be used in wet conditions. There are many types of water shoes. Choosing the right one will depend on a few things like the terrain and comfort of your kid. If they are most comfortable with running shoes, for example, they will want water shoes in that style. If they are more of a no shoes type, a water sock may be best. Much like adult water socks, there are also kids water socks. These are a type of water shoe that mimics socks. Instead of having the traditional shoe layout water socks are made out of a more flexible material. They are easy to put on and will stay on your kid’s feet until you take them off. These are great for fussy kids or those who have sensitive skin as there are no places where fabric bunches. Having a quality pair of water socks are the best for snorkeling. This is because they will provide a non-bulky layer of protection against your child’s feet. 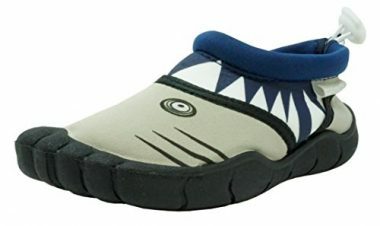 This type of water shoe works well with their snorkel fins as it makes it so their feet will not chafe. These socks are ideal for new walkers as they do not add any weight to your child’s feet allowing them to focus fully on their walking technique. Water shoes are just like adult water shoes, your basic shoe with added water friendly technology. They have the same look and style but are usually made of plastic or mesh. These shoes usually have a quick dry system meaning they don’t take all day to air out. They also usually have a comfortable sole that allows water to drain as well. The bottom of these shoes has excellent traction as they are made to be worn in sandy or rocky conditions. Water shoes are excellent for their ability to go from beach to hiking. These shoes provide enough support to be worn day to day while still featuring all of the top technology that water shoes often feature. The construction of these are similar to those of water shoes but are more open. They feature similar materials and features like the comfortable sole and waterproofing. If your toddler isn’t as active but still wants to have fun at the beach these are the type of water shoes you should look into. If opting for these shoes it is important to apply lots of sunscreen to their feet to avoid a strap burn. These shoes also allow hot sand to touch your child’s feet and are best as river shoes with bigger rocks. When you buy a pair of the best water shoes for toddlers and kids you ensure they have the highest technology. Kids shoes are no different. There are many features to look for when deciding on the perfect pair of water shoes for your toddler. All of these can make or break your day at the beach. To make these shoes waterproof special material needs to be used. There are few common ones that companies go to. One of these is a mesh material. It obviously has tiny holes that allow water to drain easily but the mesh also has waterproof properties that make it ideal for playing in the water. Mesh also makes the shoes feel light weight and reduce discomfort. Instead of rubbing the skin mesh stays in one position while creating a comfortable environment. Some companies use a rubber or plastic for the soft part of the shoes. These are not ideal as they can rub and cause blisters on your toddler’s feet. A better material is a neoprene or synthetic fabric. These are ultralightweight and have been specially designed to be used at the beach or pool. The sole thickness of your water shoe will depend on the environment you are planning to use them in. If you vacation in a place that has a rocky shore you may want to look for a thicker sole. On the other hand, if you are in a place that has sand you may only need a thin piece of rubber on the sole. It is important to note that the thicker a sole is the heavier the shoe will become. Finding a balance of protection and weight is a critical part of finding the best water shoe for you kid. If the shoe becomes too heavy they could lose their balance making the added protection not worth the trade off. These shoes should be easy to put on and take off. The ideal would be a pair that your child can use themselves. This will give them a sense of independence and make them feel like a big kid. If this sounds like your kid look for shoes that have a pull tab on the heel. You can show them how to use it and they will be running around by themself in no time. There are a few aspects that contribute to an ideal waterproof shoe. There should be some way for the water to drain from the shoe. This is usually done through the sole by small drain holes. When this is combined with the sole insert, water can exit while debris doesn’t enter. Your kids feet will feel much better when there is no water in their shoes making them uncomfortable. The base of the shoe should also feature a material that is waterproof. This is usually done by companies utilizing a rubber material. Not only does this allow water to not be retained but also increases the comfort of the shoe. A rubber sole gives more cushion for your toddler when they are walking and running. A: Water shoes are basically shoes which can be worn in and around the water. They usually feature waterproof materials which can stand up to the water, but the shoes themselves are not ‘waterproof’. They allow water to get into the shoe and have holes for the water to drain out. They also provide a barrier between your feet and any hard surfaces. Q: Why Does My Child Need Water Shoes? A: If your child is playing at the beach, then there is a good chance that they are going to step on something sharp. This is especially likely when they are playing in the ocean or on rocks on the coast. A good water shoe will protect the bottom of their feet from anything piercing their soles. They also provide a comfortable shoe which will protect and support their entire foot. As adults, we can get shivers when we step into and through seaweed. A great pair of shoes will provide a barrier against the seaweed as well as any other sea life which may damage their feet. Q: Can’t I Just Use Regular Shoes or Sandals? A: You could use regular shoes, but there are some problems with doing this. Water shoes are socially designed to allow the water to drain and the air to circulate. If you use a regular pair of shoes in the water, then the organic matter can build up, and bacteria can begin to grow. This can make shoes smell and damage them. Water shoes are also designed to be less slippery in wet conditions. Wearing regular shoes can pose a health risk to children. They have more chance to slip on a wet rock when they are wearing a regular pair of sneakers. Q: What Types of Water Shoes Are There? A: Aqua socks are basically a neoprene foot covering. They look like a sock, but are thicker and offer more protection in the water. They are great for keeping your child’s feet warm, but they do not provide physical protection. Water shoes look like regular shoes but are made from waterproof materials. They have a thick sole to provide protection against any impacts and abrasions. They look and feel like regular shoes but hold up better in the water. Water sandals are crafted from are same materials as water shoes but are shaped like sandals. They provide protection to the bottom of your child’s feet while providing a more open fit which is better for warmer months. Q: What Do I Need to Look for When Buying Water Shoes? A: Think about where your child will be wearing their shoes. If you only need protection for walk-in down the beach, then a child may prefer a water sock for the feeling of freedom. If there are rocks or sharp objects involved, then water shoes or sandals will be beneficial. You should also look at the type of material used to create the water shoes. Materials such as plastic are completely waterproof, and they will dry almost immediately, but they will rub against your feet. Mesh is a great material for creating breathable and cool shoes. Leather may be appealing, but it does not do well in salt water. You should look at the thickness of the sole if your child is going to be playing on sharp rocks. The more sharp objects they will come into contact with, the thicker the material of the sole should be. 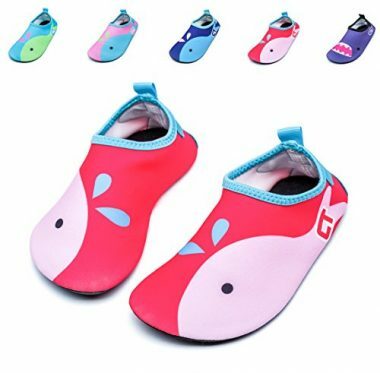 When looking for a quality pair of toddler summer shoes, it is important that you look at the best water shoes for toddlers and kids. These shoes are different from sneakers in that they are meant to withstand the wet dirty environment of summertime. These shoes are typically lightweight in design and feature a rubber sole that provides traction in wet conditions. The best shoes will easily go from the beach to a hike without struggle. It is important to look for shoes with some flexibility and elasticity. This will help to keep the foot snug to your child’s feet. This feature will protect your child from chafing once the shoes are wet. Just like your water shoes, kids water shoes are designed to be comfortable. This is why most often the tops of the shoes feature a neoprene design. 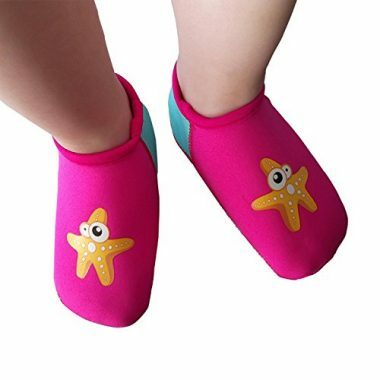 This allows them to be quick drying while allowing to water move without weighing your child’s feet down. It is important to opt for shoes that are easy for your little one to get on and off. This will make it so that your child can practice their independence when wearing their new summertime shoe. As there is a lot of competition in the kid’s shoe market, there are a lot of options to choose from. This added competition drives manufacturers to continue to make the best water shoe. This is to your advantage as there is more technology in kid’s shoes now than ever before. All of the shoes on our list are amongst the best on the market. The top shoes for 2018 these shoes are sure to make your summer much more enjoyable. Now, all that is left to do is book your dream vacation and splash in some warm summer waves. Do you use one of the best water shoes for toddlers and kids that made our list for your summertime adventures? Talk to us about how you like it in the comment section below.